Designed with optimal ergonomics in mind, you'll soon be on your way to better working comfort with the Steelcase Leap, now available with a same day ship option. The chair's dynamically-adjusting seat, armrests that move with your arms, and lumbar support conforms to you, mimicking your body in all the right ways. All of these advanced ergonomic features come together to give you a supportive seating solution to combat the effects left behind by unintuitive office chairs everywhere. Get lumbar support precisely where you need it; the Leap's fantastic LiveBack technology lets the chair adjust dynamically, with a back that forms to the curves of your spine. 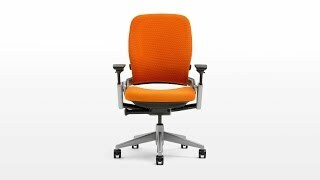 The end result is a surprisingly comfortable and ergonomically supportive chair that suits a wide range of body types. Human Solution offers the Steelcase Leap Chair - Same Day Ship with standard options in all black, for those who would like to experience this quintessential ergonomic design as soon as possible. Order early and get your chair shipped the same day - just give us a call to check availability.